On this day in 1975, “Born to Run” was released. It went on to sell millions of copies and become part of our national soundtrack. It’s no secret that Bruce Springsteen loves cars, so to celebrate the song’s success, he bought a 1960 Chevrolet Corvette. As you listen to “Born to Run,” you can imagine jumping in a muscle car, lowering the convertible top (it’s our daydream, of course we own a convertible) and letting the wind blow in your hair as you dodge traffic and escape town. While we all love “Born to Run,” if you’re going on a road trip you can’t play just one song while you drive. 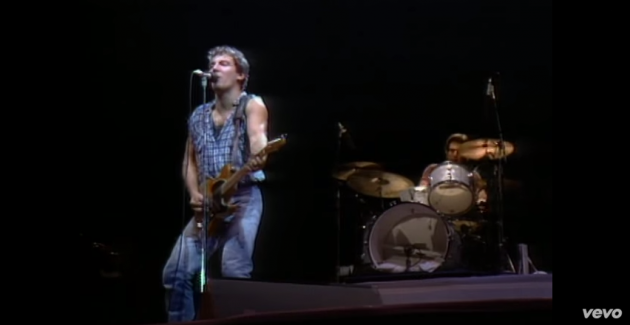 Check out five more songs about cars from Bruce Springsteen that are perfect for road trips. Let’s be honest, did you really think that we would have a list about Bruce Springsteen car songs and not include “Pink Cadillac”? When you’re cruising down the road, this is a great upbeat song to start the trip off right. The way Springsteen describes the Cadillac, you know it was a real car that one of his sweeties owned. This song is also dedicated to the All-American rides on the road, as it takes shots at Honda and Subaru. If you’re on the way home from a great vacation, even if you’re not driving a ’69 Chevy, this wistful tune is a great soundtrack for remembering the good times. The lyrics themselves tell the story of a woman who has been wronged by the world, and the narrator taking her to the sea to cheer her up in a restored muscle car. You don’t have to know a ton about cars and how they work to appreciate them, but it’s clear that Bruce Springsteen has at least a bit of know-how when it comes to them. This song is pretty much about the work he put into a car to drive home from a late night shift to meet his baby. This song came out in 1982, but it sounds more like something from the ’50s or early ’60s. Its classic sound is a nice shakeup on a rock playlist. Who knew someone could get us singing about carburetors and oil pressure? Are you taking a road trip because you’re feeling a bit trapped in your hometown? The Boss feels your pain, and “Thunder Road” is the perfect song for when you’re rolling out of the city. In the song, he’s trying to convince Mary to come with him after graduation to make their lives in a new city. Who wouldn’t want to jump in the car with Bruce as he’s riding out of town and “pulling out of here to win”?